I’ve got a few disjointed cycling thoughts swimming around in my head. I might as well get them out there. Sometime in the last couple of weeks, I reached 1,000 miles of cycling for the year. This feels odd because from January through March, I actually rode more miles than in any previous year. But, nearly all of it is commuting and other utility cycling. Very few recreational rides. So, it doesn’t feel like I’ve been riding as much. I tend to not count commutes when I’m thinking about the riding I’ve done, but truthfully at 11-12 miles per day, it adds up to a lot. That said, I don’t anticipate the huge upswing in mileage in April/May this year that I had last year. I commute on the fixed-gear bicycle on Monday. I found it a lot of fun riding around campus, and town, on the fixed-gear bike. The biggest downside was, I worked up much more of a sweat than I normally would, on a geared bike. Also, I had to carry my backpack on my back instead of in my milk crate. Not very comfortable. On my way home that day, I thought I felt more play in the chain than I should. 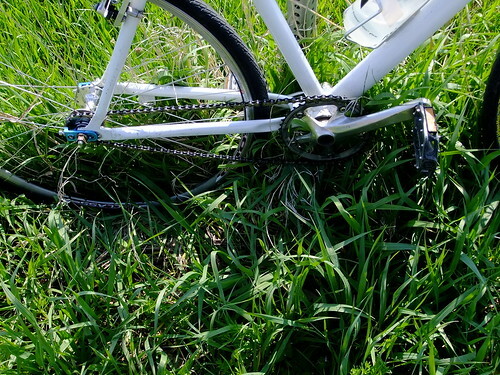 On closer inspection, I noticed my chainring is coming loose. I’ll have to fix that before I ride the fixed-gear bike again. That made three fixed rides in a row (or four, if you count morning/evening commutes separately). The next day, I commuted on the Trucker. Coasting felt really VERY odd. I was a little surprised at how tricky it was to switch back. Yesterday I found time for a brief evening ride on the Bianchi. After riding the slow Trucker and pedaling harder on the fixed bike, the Bianchi felt even faster and smoother than usual. And, I managed to push up the hills in a bigger gear, too. It just felt GREAT riding such an efficient bicycle. This was the most refreshing ride I’ve had in a while. 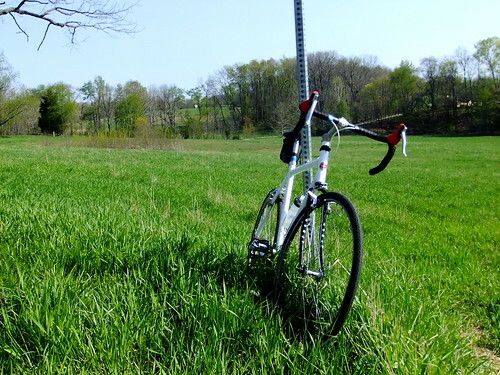 I got out for my second ride on the fixed-gear configuration of my Little 500 bike. Speaking of which, it’s Little 500 week/weekend, and there’s been tons of talk about Little 5 on campus. Shockingly little of it has anything to do with cycling, however; first and foremost, it’s a huge week for partying. Since I live off campus, I don’t really see much of what’s going on. That’s probably fine. 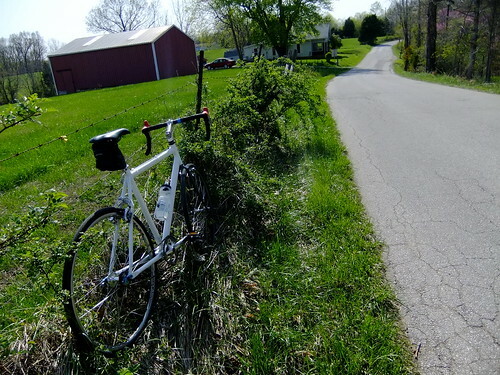 Anyway, this ride was a lot longer than my first fixed-gear ride, with more hills, but nothing too crazy. 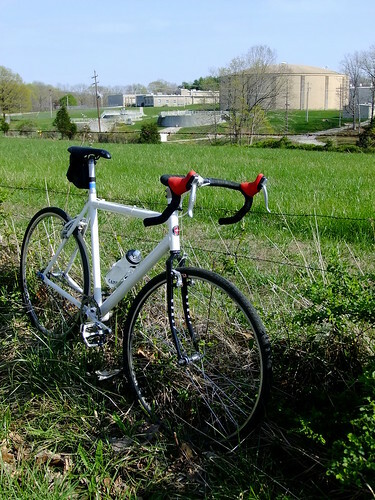 I rode about 15 miles, out to the Water Works facility and back. Riding fixed still felt awkward at first, but I started getting the hang of it. It’s amazing how fast the pedals get turning when going downhill, or even on flat ground with a tailwind. It’s fun, but once the RPMs get above a certain rate, I have trouble keeping up. I’ve gotten a bit better, and smoother, at using my legs to slow down, but when I’m really going fast or need to stop quickly, the front brake seems to be my best bet. 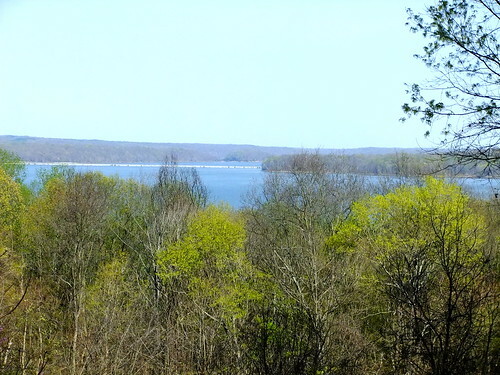 There’s a nice view of Lake Monroe from this ride, which looked beautiful with things turning green. 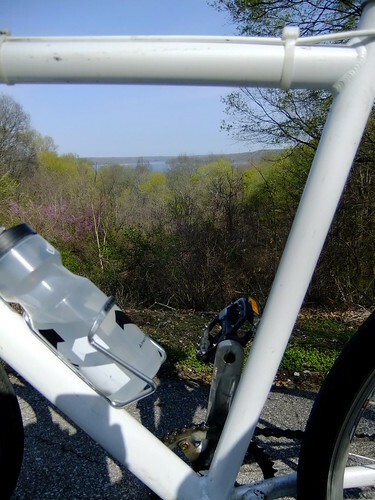 I stole the idea for this next shot from Doug — framing the view with the bicycle frame. One issue I’m having with this bicycle is that it can’t decide what it wants to be. For a while I was riding hard and relatively fast, and it felt pretty good as a go-fast bike. 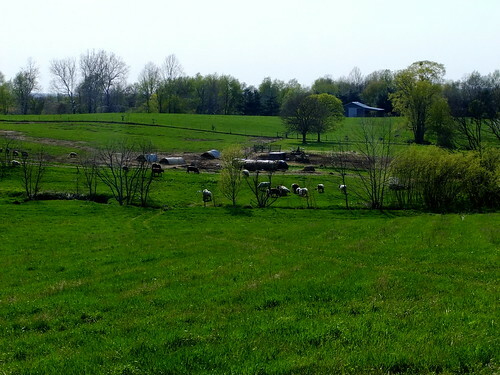 But then I slowed down to more of a mosey, and that may have been even better. Most bikes I’ve ridden seem to be clearly better at either fast or slow riding. This one seems good at both. When I stopped to take the photos above, some roadies went by. I assumed I’d never see them again, since I was stopped for a few minutes, and they were moving at a good clip (and they had, you know, gears). But, a few minutes later, I caught up with them on a long-but-gradual climb. Toward the top of the hill, I passed them. Now, they weren’t pushing hard at this point, but this reinforced that I might have a hope of keeping up with geared bikes — at least on climbs. I finished the ride surprisingly tired. I felt a little beat up, kind of like I feel after I go mountain biking. I’m not sure if this is inherent to fixed-gear riding, or if that feeling goes away, once you get used to it. 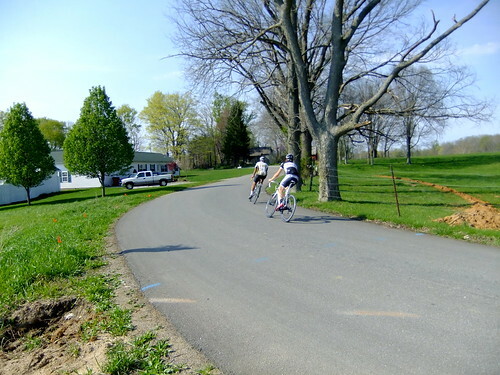 I got a bit more comfortable with the different fixed-gear style along the course of this ride. I don’t feel quite as awkward, most of the time. But, I have yet to really see any advantage over free-wheeled single speed riding. Oh, I did try something Chris suggested: slowing down gradually by just pedaling lightly (as opposed to putting back-pressure). This was pretty fun, and when I didn’t need to stop quickly, I found it to be a pleasant way to stop. I need more experience with the whole fixed-gear thing before I decide if it’s for me or not, but I will say that this ride was a lot of fun!